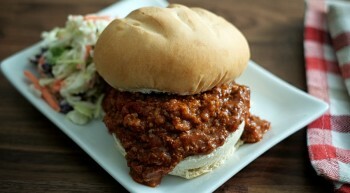 Vanee Sloppy Joe is made from ground beef smothered in a sweet BBQ sauce, rich in tomato flavor with a touch of smoke. Perfect for Sloppy Joe sandwiches, as a hot dog topping, or on baked potatoes. 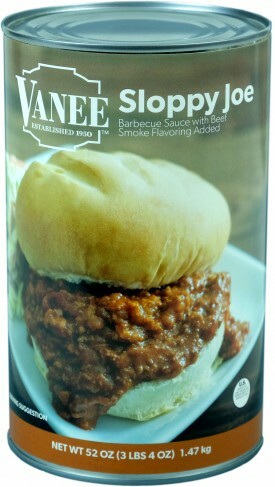 Vanee Sloppy Joe contains no high fructose corn syrup, already has beef in it for heat-and-serve simplicity, and is shelf stable for easy storage. Each 52 oz. can has 12 half-cup servings, for a total of 72 servings per case. Put 3 oz. on a hamburger bun for Sloppy Joe sandwiches, use to make sloppy mac, or as a topping for hot dogs or baked potatoes. Beef, Water, Tomato Paste, Sugar, Textured Soy Concentrate (Caramel Color added), Salt, Food Starch-Modified, Vinegar, Dehydrated Onion, Spice, Citric Acid, Natural Smoke Flavor, Dehydrated Green Pepper, Dehydrated Bell Pepper, Garlic Powder, Oleoresin Paprika.